Envision a heavenly oasis in the middle of a bustling city; an expanse of verdant greens, sparkling waterscapes, serene architecture…a peaceful, relaxed space where you could stay, unwind, rejuvenate. That’s The Grand, New Delhi for you. A fabulous retreat right in the heart of the capital city; it is a delight for the leisure and business traveller alike. We were recently invited to a fine Italian meal at their restaurant; “It”. Curated especially by their Exec Chef, Neelesh Dey, the experience was one that actually left me short of words to describe just how wonderful it was. 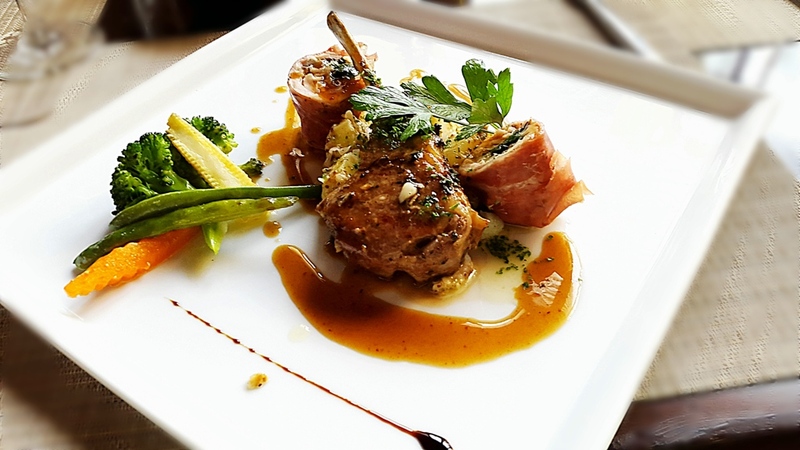 Chef Dey has worked with some of the finest properties across the globe and honed his skills to a fine art, an unmatchable style and created his own signature that sets him apart. So as we entered the restaurant, the name IT had us befuddled, but I guess you get used to it in a bit; what’s in a name, eh? 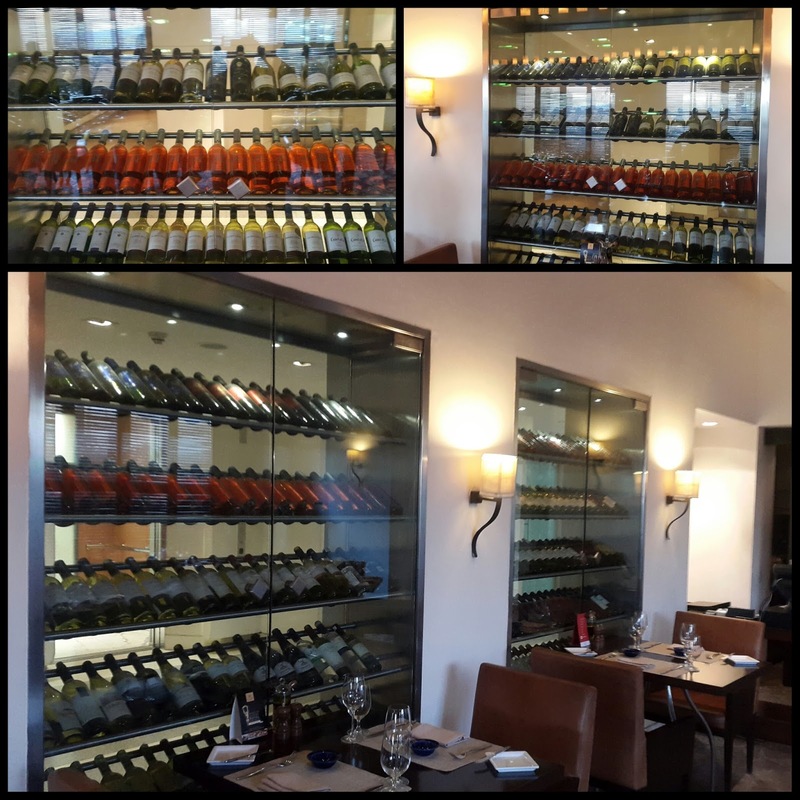 Beautiful décor, elegant lighting, a wall of the finest wines will all be vying for attention, till right at the end of the walk you spot the lush green lawns outside. So we seated ourselves at a table with a view of the beautiful al fresco dining area. The table was set to invite us with some of the most beautifully baked breads accompanied with a richly flavored olive dip. Fresh-baked aromatic bread is a huge weakness with me. Thanks to all the weight loss shows on television, you’ve probably heard to lay off the breads to the point of badgering, but there is just no keeping me away from them. I mean really, how do you go for an Italian meal and not have bread? That just wouldn’t be right. Our meal started with a salad, the very refreshing Tom Caprese. Milky buffalo mozzarella, and tomatoes dressed in basil infused olive oil; what’s not to love. Chef Dey is an avid gardener and has his own patch of awesomeness on the property. Our salads came decorated with grape and olive tomatoes! Tiny bites of tartness and sweetness like no other; the basil flower and also the dog flower graced this very beautiful plating. For the antipasti, we were served the Pollo alla gnocchi; a minced chicken gnocchi with chestnuts, kalamata olives with a porcini reduction. Melt in the mouth and such a divine flavouring, we couldn’t help but order another portion. There is something to say about the plating too. It is so artfully done that you spend a minute just oohing and aahing over the piece of art that’s been placed before you. So this was essentially hearty Italian food, cooked like it is done in the Tuscan region; very homey, grandma style cooking. But, plated beautifully like French food with great eye to detail. You must stop and take notice of every swirl of colour, twirl of leaf, caress of petal before you set your fork and knife to work. The soup, Chef had chosen for us was the hearty Zuppa del contadino, a special of his on the menu. It is a farm fresh vegetable soup with a sliver of cheese. The soup dish is brought out to you with the vegetables, beans and cheese. The soup is poured in right in front of you, affording a glimpse into the delightful ingredients that you will be eating. This was one of our favourites in terms of the presentation. 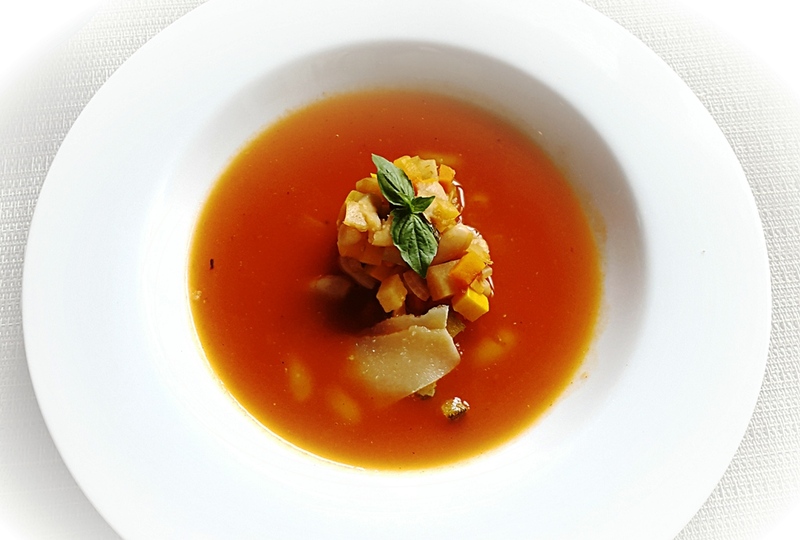 With minestrone, it is very important to get the balance of sweet and tart right. The Zuppa del contadino was right on mark; very fresh and appetizing. Our meal was paired with some really good white wine and a sparkling too, which enhanced and complimented the food perfectly. The Grand is celebrating the newly launched Artisan Pizzas on their menu. We were really keen to see an artisan pizza. Given Chef Dey’s magic with plating, our expectations were, well, grand! We had the Gourmet Pizza Ortolana. Our verdict – masterpiece! The perfect thin crust, the cheese, the greens, tomatoes, olives…just heaven. And it was just so beautiful I almost didn’t want to take a bite. The restaurant has a Pasta Doppio Sapore section on their menu. That’s basically a twin taste pasta, giving you the pleasure to enjoy two complementing flavors on the same platter. We were served the Ravioli e tortellini in salsa rosso – homemade spinach ravioli and mushroom tortellini in spicy pink sauce. It’s some of the finest we have eaten. Attention again to the chef’s choice of leaves. Do bite in; their distinct flavors will add a new dimension to your palette. The sauce was velvety textured with just the right balance of tart and spice. The mushroom and the spinach stuffed were a fantastic flavor. There was a tiny sliver of black radish decorating the ravioli. Now this is hard, rough and very pungent, so taste only if you are open to such flavors. We have to taste most things, for you of course. Time for a palette cleanser…. The saffron sorbet served garnished with mint in a martini glass; the absolute high point of the meal. Refreshing and such a happy flavor. Beautiful to look at and tastes even better. Chef Dey and his team have introduced a summer sorbet menu that you must not miss. It has a list of surprising flavors that I am sure will all be as delightful as their saffron sister. Next up, Chef especially created for us a duet of coppa, Parma wrapped chicken rollatini & lamb chops. The Lamb chop was so juicy and well grilled , It was so far the best , ever had. The ham wrapped chicken was again a level above to what we had eaten ever before. It was soulfully flavorful. And now for the dessert….When the dessert was served, the glee on my face was apparent. We already anticipated , this is again going to be something really different and great. The olive oil ice cream is going to be an acquired taste, let me warn you. But its one I wouldn’t have missed for the world. Its inexplicable, the flavor, for us. You get a strong taste of olive oil as it touches your tongue, then the coolness accompanied with a sort of tartness that can’t quite be identified , and mind it ; No dairy is used in it at all and its as creamy as it can be… Chef wants it to remain a mystery! The milk caramel ice cream is going to be a very familiar flavor for the Indian palette. All our milk-based sweets essentially go with this milk thickening process and caramelizing. What makes it stand apart is a touch of salt that’s really quite awesome. The tiramisu was brilliant too as was the blueberry cheesecake. An infinitely satiating meal…. A wholesome experience….A class in art….. An exhibition of skill and craft…… Brilliance in every spoonful….Craving for more….